FREE Bonus Material to Help You Read Through Will It Fly? If you've already picked up my book, thank you! If you stumbled upon this page without getting the book first, I highly recommend you click here to go to Amazon and pick up a copy of Will It Fly? to make sense of all the material here in this free companion course. The Will It Fly? Companion Course is an add-on bonus to my book, Will It Fly? Think of it as a fun, helpful read-along that allows me to serve you even better! Several chapters in Will It Fly? include thought experiments and exercises to help you find and validate a business idea that works for you. 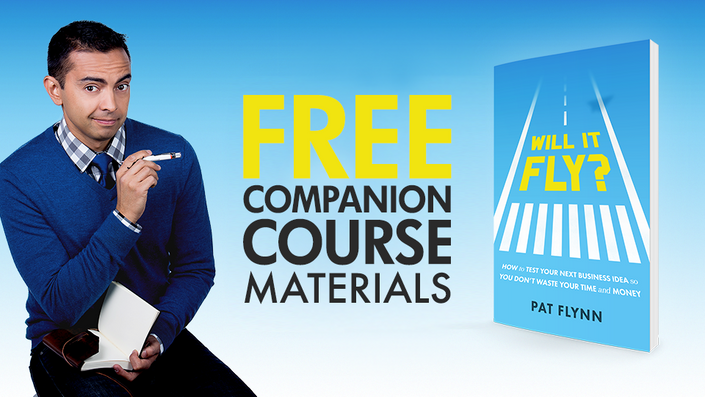 The bonus and supplemental materials in this free chapter-by-chapter companion course will help you enhance your reading experience with Will It Fly? and implement what you learn even faster. The Will It Fly? Companion Course was designed to provide a little extra oomph to aspiring business owners who are testing out their business idea with the Will It Fly? book. Start date: Whenever it's good for you! Course length: The length of the course is up to you. Take your time, don't stress it. Bonus items, including downloadables, videos, and exclusive interviews. Conceptualize and understand your business idea. Define and refine that idea down to the most minute detail. Discover where your idea should live, from market to niche and customer P.L.A.N. Validate your business idea so you're ready for your first customer! More than 15,000 students have benefited from the Will It Fly? Companion Course. That makes me so happy. But it's also not surprising to me. There are so many amazing ideas out there. But not a lot of those ideas make it off the ground because people don't know where to start. With this course, I'll give you the tools to take your idea through the proper validation so you can help it fly high!